Can't play MJPEG video on Mac or PC? Trying to find a MJPEG player or convert MJPEG to AVI with best quality? Want to edit MJPEG videos with Adobe Premiere Pro or enjoy MJPEG on PlayStation or Xbox360? MJPEG is related to Motion JPEG file format, but not widely used or supported by media players, video editors, portable media players, smart phones, etc. In order to enjoy MJPEG videos anywhere and anytime you like, converting MJPEG to a popular video format is necessary. Acting an ideal MJPEG to AVI Converter, Bigasoft Total Video Converter can fast convert MJPEG to AVI and various video formats with best quality. Why you choose Bigasoft Total Video Converter? Convert MJPEG to AVI and other video formats, like MP4, H.264, WTV, WMV, MOV, MKV, etc. Convert MJPEG to compatible formats for Windows Movie Maker, iMovie, Adobe Premiere, Final Cut Pro, Sony Vegas for editing. 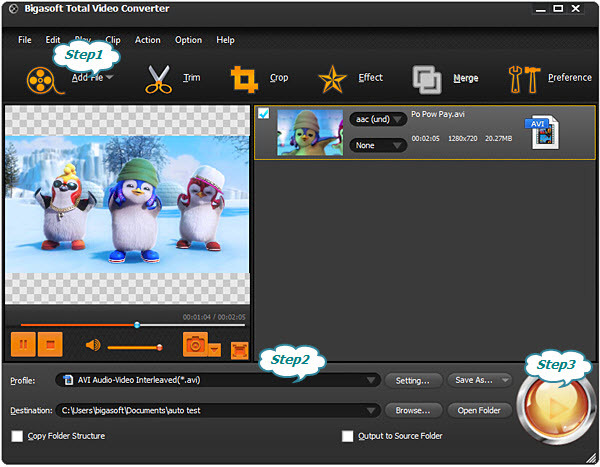 Cut, merge, split, crop, add or remove subtitle, add effects to MJPEG files and export to other video formats easily. Convert MJPEG for playback on Xbox one, Xbox 360, PSP, Samsung Galaxy, Sony Xperia, Blackberry, Microsoft Surface, iPhone, etc. Convert any format to AVI, including DVD VOB, MKV, WTV, MOD, DAV, TiVo, M2ts, MP4, H.265, MOV, ProRes and more. More than 200 input formats supported. Convert MJPEG to AVI, FLV, MP4 to upload MJPEG to video sharing websites, like YouTube, Facebook, Vimeo, Dailymotion and more. Download 4K, 1080P, 720p YouTube video to AVI, MP3 or other video/audio format. Firstly, download Bigasoft Total Video Converter and install. There are two different versions for Windows and Mac users separately. And the two versions are fully compatible with the latest OS. Pick the right version to download and install. Drag and drop the MJPEG video into the main windows to load it, or click "Add Files" button and choose the video file in the "Add Video Files" dialog box that appears. Simply click "Profile" drop down button to choose AVI profile from "General Video" category for output. If you want to keep the best quality, just try HD WMV from "HD video". In addition, SD/HD DivX and Xvid AVI are supported. Tip: Click "Effect" button to open "Edit" Window to edit the MJPEG, add or remove subtitle track or cut or merge MJEPG files. Click "Convert" button to start the conversion. Once finished, just click "Open Folder" button to open output folder and enjoy the converted MJPEG AVI video. Besides, this software also helps to convert MJPEG to MP4 on both Windows and Mac. 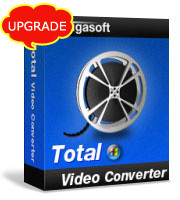 Download and try this all-in-one Video Converter - Bigasoft Total Video Converter.